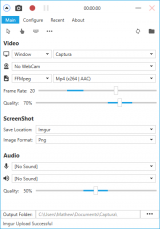 Captura is a free and easy to use utility which offers you the possibility to capture your screen, audio, webcam, mouse clicks, cursor and keystrokes. The application comes with support for 10 different languages and is able to run minimized in your system tray. Captura offers support for command line parameters and lets you capture screenshots and control your recording with the aid of hotkeys. The hotkeys can be configured according to your wishes. Moreover, Captura is able to mix speaker output audio and microphone input audio. The program is also able to capture keystrokes and mouse clicks. Multiple customization options are included. You can use the Region Selector tool to capture only certain areas on your screen, as well. Captura can be used to record your game play, create tutorials, create presentations, and much more. Webcam view can be included in your recordings. The program is suitable for tutorials and presentations. You can configure the hotkeys according to your wishes. Captura has been tested by Download82.com team against viruses, spyware, adware, trojan, backdoors and was found to be 100% clean. Our editors will recheck this software periodically to assure that it remains clean.